Craftin' Caro: April is 8th ANNIVERSARY MONTH! April is 8th ANNIVERSARY MONTH! You know the expression, "Time flies"? Well, it blows my mind that this April I am celebrating my 8th year as a Canadian Stampin' Up! demonstrator! 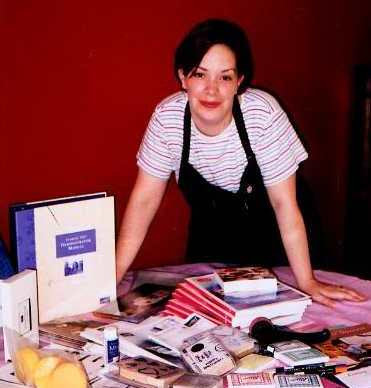 Here's a picture of me from all those years ago, after I got my Starter Kit delivered to me. Aren't I cute? Who would have thought that the crazy impulsive decision to sign up would have brought me to where I am now: still loving Stampin' Up!, still loving what I do, and even more than ever before. So how I am celebrating it with all of you this month? FREE STAMPS: I'm giving away *8* stamp sets -- 2 each for all 4 weeks. Anyone who attends a class or places an order that week will be entered into a draw to win one of the stamp sets offered! Draw dates will be Fridays April 9th, 16, 23 and 30 and the winners will be announced here. FREE "IN COLOR" GOODY PACKAGE: All product orders of $50 or more with me this month will include a special "In Color" goody package from me: 2 sheets each and 1 yard of polka-dot grosgrain ribbon each for all 6 of the In Colors currently available! FREE TUTORIAL: This month's featured Tutorial is to help you create a "Year in Review" scrapbook. Whether you are a scrapbooking addict or a novice, this speedy 6” x 6” album is the perfect way to save and share some of your special memories in a flash. You make use it to highlight a family trip, holiday celebration, each family member, important events and every day moments that create a snapshot of your year. Create this special album for yourself, your family or as a Mother’s Day or Father’s Day gift for the special family members in your life! This wonderfully detailed 26 page tutorial will be emailed to anyone placing an order or participating in a class with me this month. 2 FREE DVDs: Receive 2 free "Workshop Wow" DVDs with over 250 minutes of stamping and paper crafting ideas from Stampin' Up when you order your Starter Kit. The fabulous DVDs have a value of $53.92 and are available only while supplies last. Contact me for details on ordering your Starter kit! SURPRISE SPECIALS: Be sure to visit the blog often as I'll be sprinkling some surprise specials throughout the month as we go.. you won't want to miss out! Be sure to add me to your blog reader or else subscribe here for updates. Has it really been 8 years since we signed up? Oh how I remember that evening! Congrats to a Wonderful Lady!! You truly are an inspiration to us "not so seasoned" demo's. Keep up the great work!!! It is a pleasure to know you and see your success!! !